The Truth of the Resurrection defines the mission of the church. 2 Main Points: Our religion is not personal. The mission of the church is the preaching of the Gospel. God gives the honest what they need to believe. 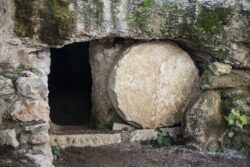 2 Main points: The Resurrection of Jesus is a historical FACT! The Resurrection is the greatest comfort to man. Most of our lives will be lived beyond the grave, and we should live accordingly. Three main points of the Resurrection: Death hurts the very heart of God. Jesus will resurrect you and me. Pride is what kills the dead. Jesus has lovingly told us what will happen in the Resurrection.